The Universal Declaration of Human Rights (UDHR) was signed by the United Nations General Assembly on 10 December 1948. 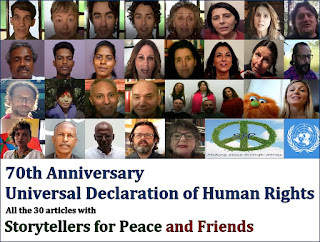 This year we invite you to celebrate its 70th anniversary with Storytellers for Peace. Indeed, since we think that human rights regard all of us, not just storytellers or artists, this time we involved in our video also relatives, friends, and who else wanted to join us. Because, more than ever today, we must remember that this Declaration is still the best thing we have got. “Storytellers for Peace” is an international network of narrators who create collective stories through videos. Artists and stories are from all over the world and speak about peace, justice, equality and human rights. The project was created and is coordinated by Alessandro Ghebreigziabiher, author, playwright, storyteller, stage actor and director.